Q Source's Daylight Company Inventory Clearance offers an extra 10% off on select Daylight Magnifiers for a limited time. Shop now to save, because this offer only runs until May 31, 2015, or until supplies run out. Daylight Company U22020-01 Ultra-Slim White Magnifying Lamp with 1.75x Magnification 7" Lens- Regular List Price: $290.00, Inventory Clearance Price: $161.11 - The Daylight U22020-01 combines the largest precision glass lens (17.5 cm/7") with the strongest Daylight™ (28W - 150W equiv.) so you can see more of your work in precise and clear detail, and work for longer in comfort. Includes table clamp and lens protector. Daylight Company U22080 Ultra-Slim White Magnifying Lamp XR with 1.75x Magnification 7" Lens- Regular List Price: $300.00, Inventory Clearance Price: $182.93 - The Daylight U22080 features a bright 28W Daylight™ light, the unique 17.5 cm/7" XR™ lens, and the Free-Motion head-joint™. The lamp has been designed to allow for extremely easy operation and reliability, plenty of comfortable daylight light, and precise, smooth positioning. The lamp also features the Quick Lens Swap System™ so you can increase the magnification in seconds without any tools. Daylight Company U25030 Slimline LED White Magnifying Lamp with 1.75x-2.25x Magnification 5" Lens - Regular List Price: $200.00, Inventory Clearance Price: $121.95 - The Daylight U25030 is a uniquely stylish lamp that is perfect for all detailed work. It includes a table clamp, an adjustable internal spring arm that can position the lamp easily with one hand, and features two easily changeable 5" lenses (1.75x and 2.25x). Daylight Company UN1040 Naturalight White Table Magnifying Lamp with 4x Magnification - Regular List Price: $63.00, Inventory Clearance Price: $35.00 - The Daylight UN1040 features a combination of a 12W Full-Spectrum Naturalight tube and a 3.5" lens. The Naturalight Table Magnifying Lamp’s design allows you to see details like never before without squinting or headaches. 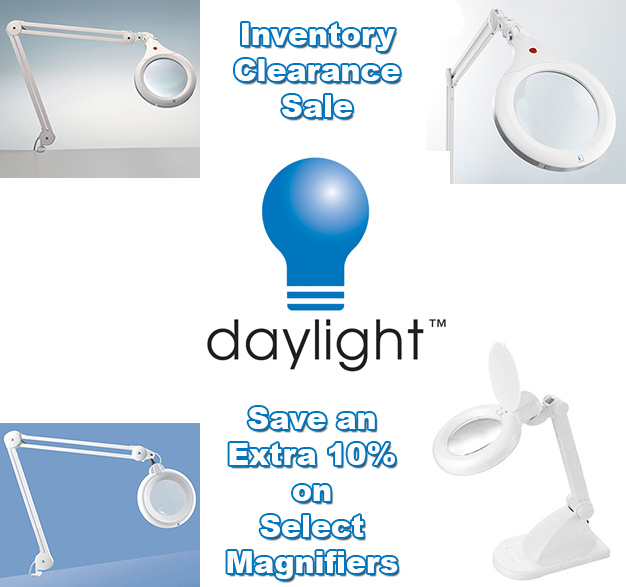 Visit our Daylight Co. Magnifier Inventory Clearance Sale page at QSource.com to purchase your eligible lamp and save an extra 10% today. For a complete selection of Daylight products, please check out our Daylight Company manufacturer page. You may also contact us by phone (800-966-6020), email, or via our Web site.